All of my Alexa enabled devices are configured with the correct geo location, but I’ve had doubts for some time as to the accuracy of weather forecasts. We have a winter storm heading this way, I’ve got email alerts from Accuweather, FEMA is sending notices, but Alexa thinks the weather will be fine. 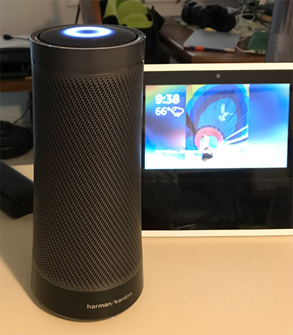 Harman Kardon launched its Invoke Cortana powered speaker on October 22, 2017 into an arena dominated by Amazon’s Alexa and Google Home. As many reviewers have noted, the Cortana powered speaker is very late to the game. The hardware is terrific both in aesthetics and sound quality (I’d expect no less of HK) and I think the product is (currently) great for very small apartments and particularly good for folks tied into Microsoft’s ecosystem of Cortana and Skype and Office/Outlook. My Invoke speaker sits on a kitchen counter along with an Alexa enabled Echo Show and I have a Google Home device a few feet away. In a sense, I have the best of all worlds, but I certainly don’t expect the average person to have all three flavors of digital assistant devices. I’ve got an iPhone and an Apple Watch, so I also have Siri available and of course Cortana is available on my Windows 10 PC’s. For Skype users, there’s a nice promo for free calls to landlines and cellular (read the fine print for areas covered). Using the Invoke speaker, I find that the calls I make sound great and the party I’m calling does not detect any difference good or bad in quality or know that I’m calling from a “smart speaker”. Since it sits on the kitchen counter, it’s a handy device for conversation there while my hands are covered in whatever (and certainly the calls are better quality than yelling at a cordless handset in speaker mode in the same location). One of my favorite features involves Cortana’s location based reminders. Simply put, if I say “Hey Cortana, remind me to buy Chapstick”, Cortana asks “when would you like to be reminded” and I respond “when I go to CVS”. Cortana then advises me of the address of the closest CVS and asks if I want to be reminded there. I acknowledge, etc. and Cortana sets up the reminder.This reminder is configured across all Cortana devices and when I’m driving by that CVS, Cortana pops up the reminder on my Apple Watch. I find this very handy when I’m in the kitchen and need to set this kind of reminder. Neither Alexa or Google can do this (although Alexa can set named reminders while Cortana and Google cannot). Calendar and Schedules for both Outlook and Office 365 are one area with Cortana and Invoke that I find really useful. Being part of the Microsoft ecosystem, both are available as Connected Services. I can ask for my schedule and set new appointments. While I can do this with Alexa, the Alexa skill requires that I re-authenticate every so often, usually when my hands are covered in meatloaf mix when I’m not at a computer. I am hopeful that the Cortana connections don’t require the same down the road. If you don’t need whole home audio, the sound quality from the HK Invoke is terrific.But right now, the available music service offering through Cortana is missing some of the big names, but we know that Pandora is coming (but haven’t heard anything about Deezer, and I guess it would be a long shot to expect Amazon Prime music via the Invoke*). You can certainly pair another device via Bluetooth and play other music services over Bluetooth, but the quality can suffer. If you are a Groove—>Spotify customer, it’s pretty awesome. Playing music from Spotify via the Invoke as I work in the kitchen provides rich, full sound. As a speaker, it’s better than the original Echo from Amazon. If you have a multi-floor home and want to fill the house with sound or are just moving around a lot, there’s no way for a linked speaker experience with linked Invokes. Alexa now has a synchronized multi-room audio function and of course there is Sonos. 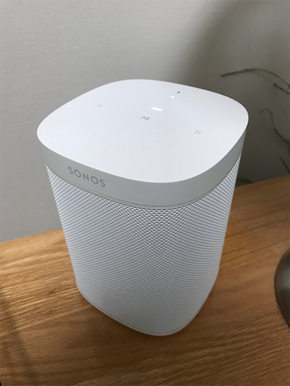 I’m invested in a whole home Sonos system with Play 5 speakers and with the new Sonos One with Alexa on-board, at the same price point as HK Invoke, I think it is going to be tough for HK Invoke to gain a large following. Perhaps down the road if the initial Invoke offering is successful, there will be enhancements to provide for multi room, whole house coverage. Time will tell. I’ve got more Connected Home/Smart Home gear than most people. Cortana’s Connected Home Skills aren’t enough for me, but may be good enough for folks with simpler needs. At launch, the Connected Home support is available for Wink, Insteon, Nest, Hue, and SmartThings/Samsung Connect (Harman Kardon is owned by Samsung). 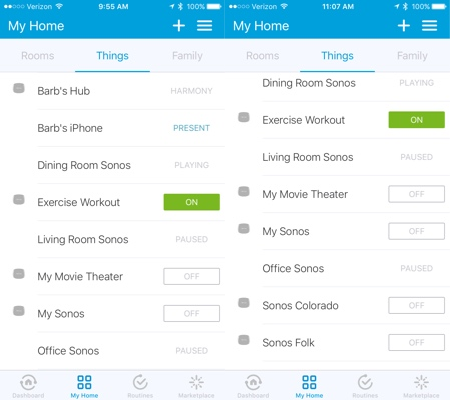 SmartThings enables more complex tasks involving multiple devices, etc. 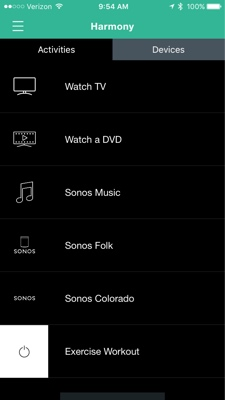 and having my Harmony Hubs connected via SmartThings, I can turn on my Home Theater with a single command, “Hey Cortana” (same for Alexa), “turn on my movie theater” which turns on the receiver, TV, and cable box (etc.). 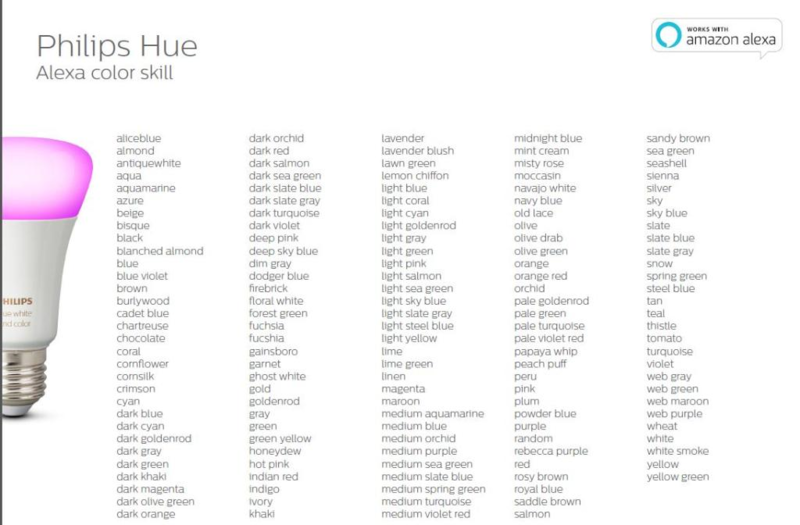 I’ve got a lot of Hue colored lighting (bulbs, Lightstrips, Bloom lamps) and there’s no support for changing colors (or scenes) and that is a biggie. There’s no group or room support either. The “chandelier” in my dining room has three Hue Candelabra lights, grouped under the name “Chandelier”. There’s no way I’m going to tell Cortana to turn on three lights individually when all I need to do is tell Alexa to “turn on the chandelier”. Or turn on four individual lights in the living room, etc. Perhaps better connected home support is coming*. We’ll see. There is a huge gap of missing “A” list skills. Microsoft states that IFTTT is coming, but there is no timetable. Alexa, which admittedly has been out in the market for a long time, has the real edge on skills, including geeky ones like Harmony, Dyson, Roomba, etc. and lots of great list keepers like ToDoIst. Cortana supports Wunderlist, which is a lame duck app now owned by Microsoft that is not being actively developed. There are a few useful skills, certainly Dark Sky, Fitbit,iHeart Radio, TuneIn and Headline News and maybe Food Network for recipes are useful (to me) and there are some that others might find useful. But most of the rest are “entertainment”. Just no comparison to what exists on the Alexa side. 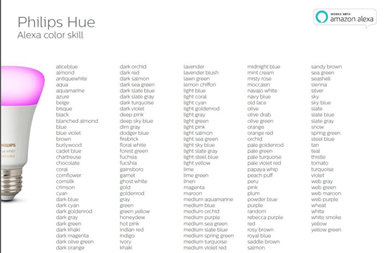 IFTTT will certainly help, but native skills are sorely needed. 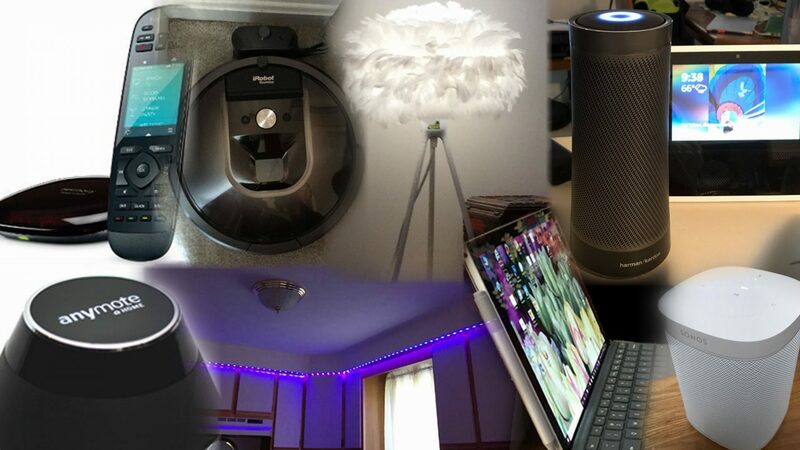 I’m hoping that over time, there will be big improvements in Connected Home and Skills and that there will be a whole home solution for audio. *There have been announcements about an upcoming marriage of Alexa and Cortana. This may fill in some of the gaps.